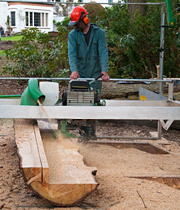 With our compact and very portable sawmill, we can convert felled trees, on-site, into potentially valuable timber. Our aim is to promote the use of local timber: acting as a link between those in the area who have trees and those who are looking to buy timber. 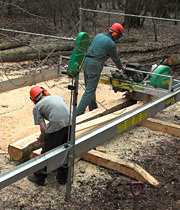 We can add considerable value to trees that may be too few in number or too hard to reach to be worth extracting and transporting to a sawmill. We can also supply builders and craftsmen with timber of unusual dimensions, cut to order. For those who have both a need for timber, for a particular project, and some trees to fell, there can be the immense satisfaction of seeing trees transformed, on-site, into perhaps a building, or a piece of furniture.